CHICAGO, Sept. 11, 2017 /PRNewswire/ -- Bankers Life, a national life and health insurance brand that focuses on the insurance needs of the retirement market, has helped raise $431,000 to the Alzheimer's Association following its 15th annual Bankers Life Forget Me Not Days. The street-corner fundraising event held throughout the U.S. in June raised just over $281,000. In addition, Bankers Life and its parent company, CNO Financial Group, recognized the Association with a $150,000 donation to aid in the support of the Association's national mission and chapter programs. Since 2003, Bankers Life has helped raise more than $5 million for Alzheimer's care, education and research programs. 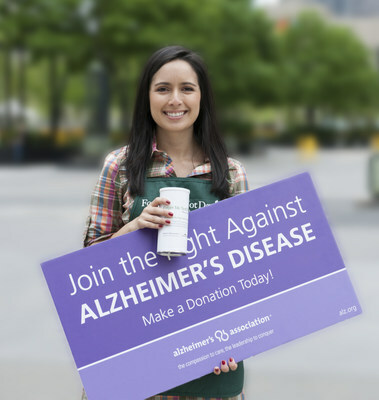 "Every year, an overwhelming number of Bankers Life associates, agents and volunteers dedicate their time to collect donations and increase public awareness of Alzheimer's disease in their communities," said Scott Goldberg, President of Bankers Life. "The growth of Forget Me Not Days for the last 15 years demonstrates our ongoing commitment and dedication to the Alzheimer's Association and its mission to advance research and provide patient and caregiver support." This year, more than 1,300 Bankers Life agents, associates and Alzheimer's Association volunteers in more than 170 cities across U.S. took to the streets to collect donations and distribute over 100,000 packets of Forget-Me-Not flower seeds. The seed packets were provided to individuals to take home and plant in honor of families across America who are facing or have lost someone to Alzheimer's. One hundred percent of the funds raised during Bankers Life Forget Me Not Days are donated to the Alzheimer's Association, the largest nonprofit funder of Alzheimer's research in the nation. "The momentum behind the Alzheimer's cause is due in large part to innovative partners like Bankers Life," said Donna McCullough, Chief Development Officer for Alzheimer's Association. "The organization and its volunteers are raising critical funds and awareness across the country while encouraging others to get involved, growing our nationwide network of supporters. We're so thankful to have them in our movement." The Alzheimer's Association is the leading voluntary health organization in Alzheimer's care, support and research. Its mission is to eliminate Alzheimer's disease through the advancement of research; to provide and enhance care and support for all affected; and to reduce the risk of dementia through the promotion of brain health. Their vision is a world without Alzheimer's. For more information, visit www.alz.org. Bankers Life focuses on the insurance needs of middle-income Americans who are near or in retirement. The Bankers Life brand is a part of CNO Financial Group, Inc. (NYSE: CNO), whose companies provide insurance solutions that help protect the health and retirement needs of working Americans and retirees. There are more than 5,000 Bankers Life insurance agents at over 300 offices across the country. To learn more, visit www.BankersLife.com.